1 of 6 Heat oven to 375 degrees F. Coat shallow 3-quart casserole with nonstick cooking spray. 2 of 6 Cook pasta in large pot of lightly salted boiling water until al dente, firm but tender, 6 to 8 minutes. Drain. 3 of 6 While pasta is cooking, heat 12-inch skillet over high heat. Add beef; cook, breaking up with spoon, until no longer pink, about 3 minutes; drain off any excess fat from skillet. Add tomatoes, green pepper, cinnamon, salt and pepper; cook, uncovered, 5 minutes, until liquid has evaporated. Remove from heat. 4 of 6 Spread half the pasta over bottom of prepared casserole. 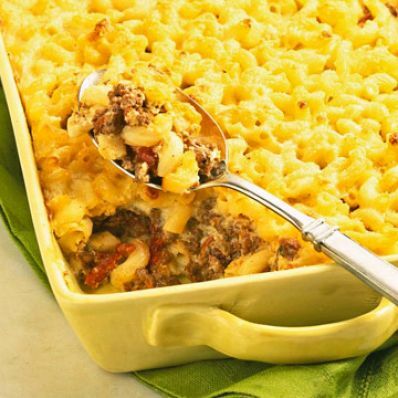 Spoon meat mixture evenly over the pasta. Cover the meat with the remaining pasta. 5 of 6 Whisk eggs in a medium-size bowl until blended. Stir in Alfredo sauce and nutmeg until well blended. Slowly pour mixture evenly over the pasta in the casserole. Sprinkle the top evenly with the grated Parmesan cheese. 6 of 6 Bake the casserole in the 375 degrees F oven for 30 minutes or until the mixture is bubbly and the top is golden brown. Let casserole stand 15 minutes. Serve with salad, if desired.